We met at Eastbourne Railway Station at about 9.30 and walked back down to the front – a series of hotels of fading Victorian splendour with a Martello tower, now restored and the Life Boat museum on the water’s edge. 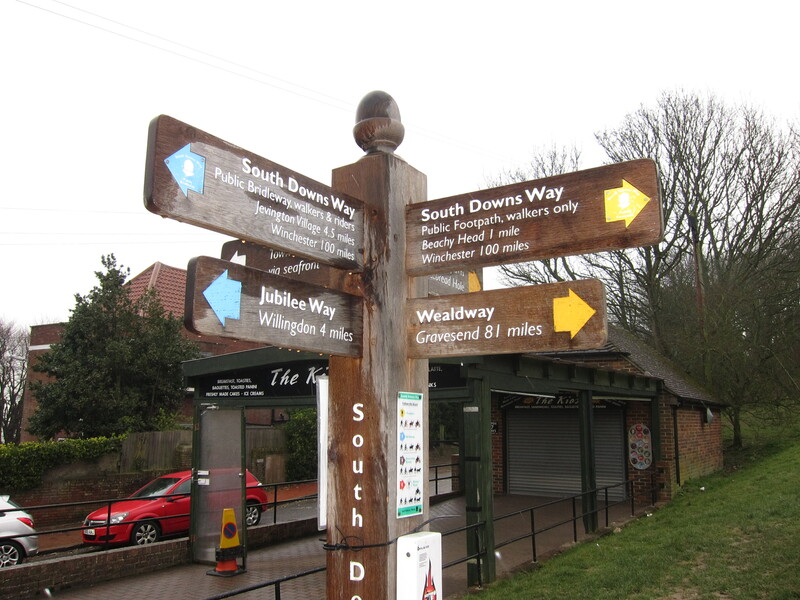 Eastbourne is the start of the South Downs Way, and as soon as the end of the prom is reached, the path climbs up onto the chalky headland. 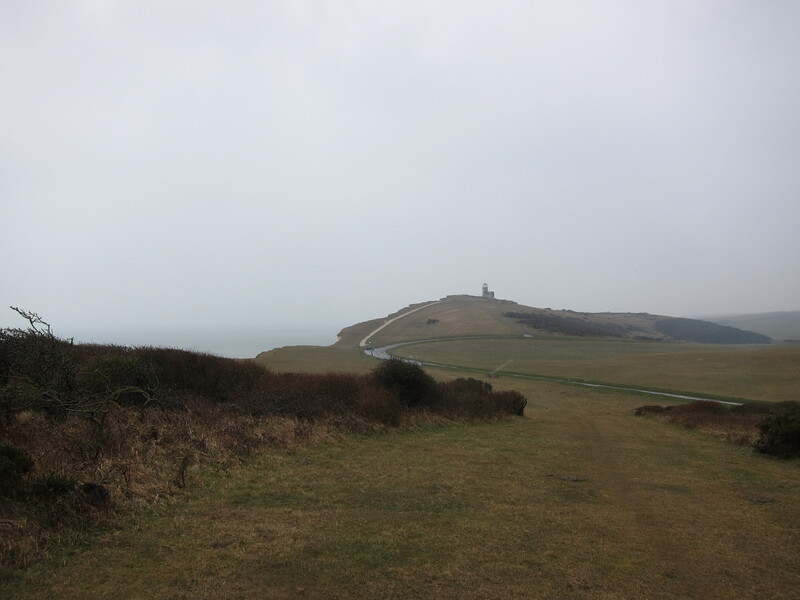 The first notable point is the lighthouse at Beachy Head, a chalk cliff of some 534 ft. Generally, the view would be stunning as, apparently, one can see from Dungeness to the Isle of Wight on a good day, but as there was driving wind, snow “flurries” (as the met office likes to call them) and rain, we could not see as much as we hoped. Nevertheless, it was pretty spectacular. The South Downs seemed surprisingly bleak. In the wind, it would be quite easy to imagine one was in the peaks or the high north country. We ploughed on, the wind blowing us ever closer to the cliff, to Birling Gap. This is a National Trust outpost, and for one ghastly moment, when we saw it covered in scaffolding, we thought it might be closed, but fortunately it was open and we had a warming bowl of soup and a shortbread Easter Bunny for me. Foolishly, I had forgotten to put the rain cover on my rucksack so my spare sweater was soaked, and worst of all, my chocolate bar was sodden! 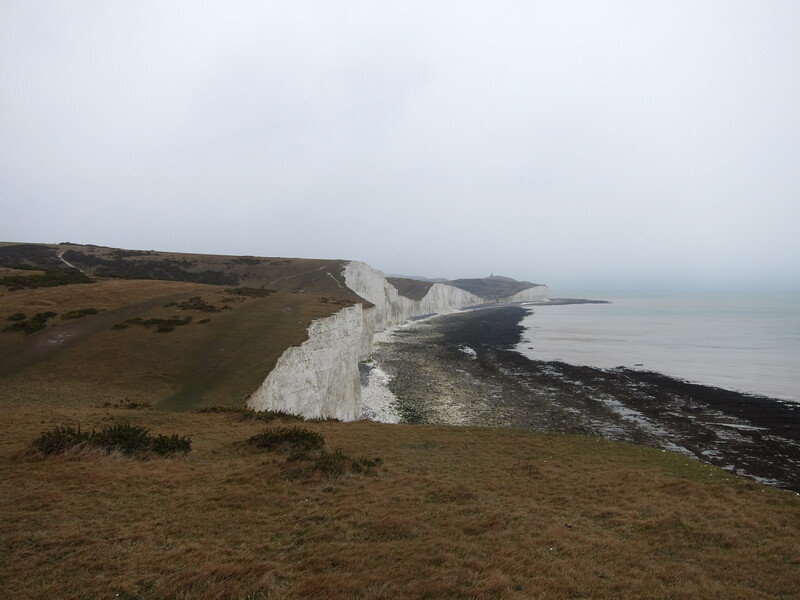 The Seven Sisters lead into Seaford with a final drop, marked “Do Not Climb on Cliff” which we noticed once half way down the steep chalk face. At this point, there are two choices, go inland up the Cuckmere Estuary for some two miles, cross at the bridge then walk down the other side, or walk across the shingled estuary mouth to the river, and wade across. Chris persuaded me that the latter option was the best. We took off our boots, rolled our trousers up and waded, knee deep in water so icey it almost made us cry with the pain. After that, the long walk along the promenade at Seaford past, apparently, the last Martello tower along the South Coast, and up Newhaven Harbour to the ferry terminal seemed uneventful.